Block crayons are great for little fingers and make a wonderful gift, but they can be really expensive. Far more expensive than pencil (wax) crayons. Unfortunately pencil crayons seem to snap as soon as Sarah picks them up. They just can’t withstand her tight, not yet developed pencil grip. 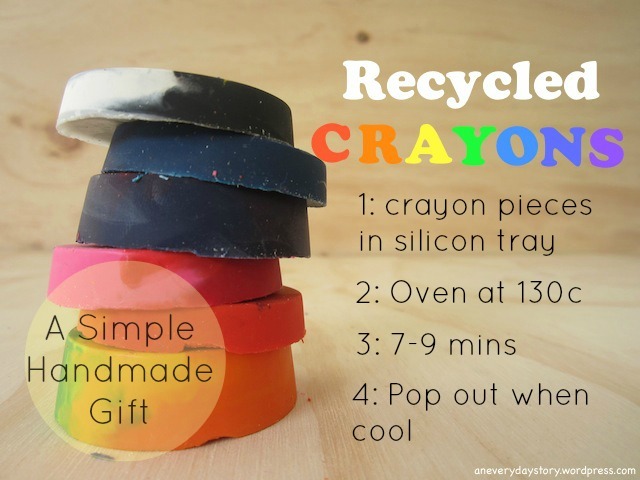 So if you are looking for a simple and inexpensive handmade gift for Christmas, why not make some recycled crayons? You can make them into all kinds of fun shapes, I recently made some Christmas tree shaped ones. I am still on the look out for an alphabet mould, wouldn’t it be great to have crayons which spelled your name? 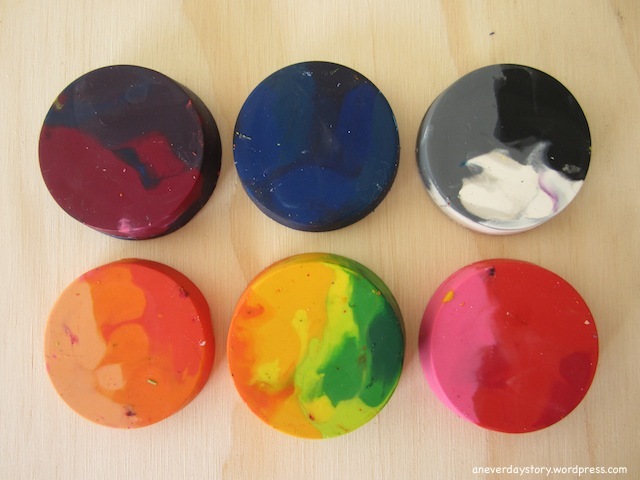 Just peel off the wrapper, break up the crayon pieces and arrange them in the mould. You can combine the colours if you like just make sure they are organised neatly in each mould (all red pieces on one side and pink on the other), that way the colours won’t all run together. Be careful when you take the mould out of the oven. They are HOT! Leave them to rest until they have cooled. Then just pop them out. If you don’t have any crayon stubs, you can pick up a 24 pack of Crayola pencil crayons for $2 at the Reject Shop (discount store). Then once you’ve made some, stack them and tie them in twine, a beautifully simple handmade gift that toddlers will love. What temp. to set oven on?